All Prototypes of Reolink 5MP Security Cameras (Round 2) Have Met Their Hero Testers. product on Reolink Amazon Store, forums, etc. 1. This unlisted product is in a limited stock (100 items) and we will select a certain number of winners every 2 days during the activity time (from Aug. 18 to Oct. 10 UTC+8). 2. You are required to send us a screenshot of any review or comment once made about Reolink products or service on Reolink Amazon Stores, Reolink Facebook page, etc., and give us the URL of the page your review/comment is on. 4. All the lucky winners will be announced on Oct. 16 on this page and on Facebook/Twitter. We will reach out to you later and send you the product for free totally. 5. Once you receive the product, you are required to submit your feedback on the page below within 2 weeks based on how you use and test the product. 6. Warranty, refund or replacement are not available for the products you have received or will receive in Play & Say feedback program. Some models are based on PoE, and some are dual-band WiFi (2.4/5 GHz supported). 4x optical zoom to zoom in for more details and to zoom out for a wider viewing angle. Much improved, incredible picture, better installation and still easy to view on my mobile when not at home 9/10 for me. Captured badgers & foxes in my Garden at night in much better quality than I have seen before, brilliant in low light and night time. The wide angle gives me a much greater view than the 3 other 4mp Reolink Cameras I have. I love the RLC-423WS. Setup was as easy as it gets and once installed has worked flawlessly. It's very fast when positioning the camera and has great clarity at night and beautiful picture during the day. It's constructed very well and hope it withstands the elements for a long time. Reolink RLC-423S has amazing clarity and functionality! This camera was exactly what I was looking for and it performs incredibly. It has amazing detail and functionality of the PTZ. The ability to adjust the sensitivity allows me to have fewer “false alerts“ due to my dogs and I have been able to set the sensitivity to always pick up humans or vehicles but yet rarely detect motion from my dogs so my notifications are not constantly alerting me as with other cameras I have tried . I record 24/7 to an external 8TB hard drive using the Reolink client with the Reolink app for my phone notifying me of all motion detection. The Reolink app makes it easy to view alerts and also to show you “live view” anytime anywhere. I absolutely love this camera and I highly recommend this 5MP POE security camera to anyone!!! RLC-423S is an awesome security camera and well worth every penny! If any motion is detected I can review the motion via the Reolink app as well as see a live view from anywhere at any time of my house. I’ve tried other cameras and they were constantly sending me notifications of motion from my dogs but with the Reolink client software and it’s adjustable sensitivity settings I am able to adjust it to only notify me of humans or cars and not notify me when my dogs walk in front of the camera. It does occasionally pick up the motion of my dogs but it is rare and with other cameras I have tried even with adjusting the sensitivity settings of them would always notify me with motion alerts from my dogs. I absolutely love this camera and highly recommend anyone wanting amazing video quality, the ease of power over ethernet connection, and not wanting to pay for a third-party storage service that this is the camera for you! two way communication via the Reolink App and if I had the ability to set off an on board alarm from my phone if an intruder was detected via motion alert I would buy more of these. This model however does have the ability to add an external microphone so you can record audio and video simultaneously to your hard drive. Thank you Reolink for an awesome camera and software!!! I have a Reolink 410 & 411 on my system & have been impressed with the products since the day of installation. I purchased the RLC-423WS in a pre-release from Reolink. Great picture clarity, easy to setup, Fast rotation (so fast I'm glad they included a 'slow the rotation setting'). I've had many different cams over years and I have found Reolink to be dependable and stable. The setup was simple and easy. I use BlueIris and a Amcrest for recording, both systems easily linked to the RLC-423WS. I plan on replacing the rest of my cam system with Reolink products in the future. I had to go with an Amcrest NVR due to the various cam mfg I currently had. 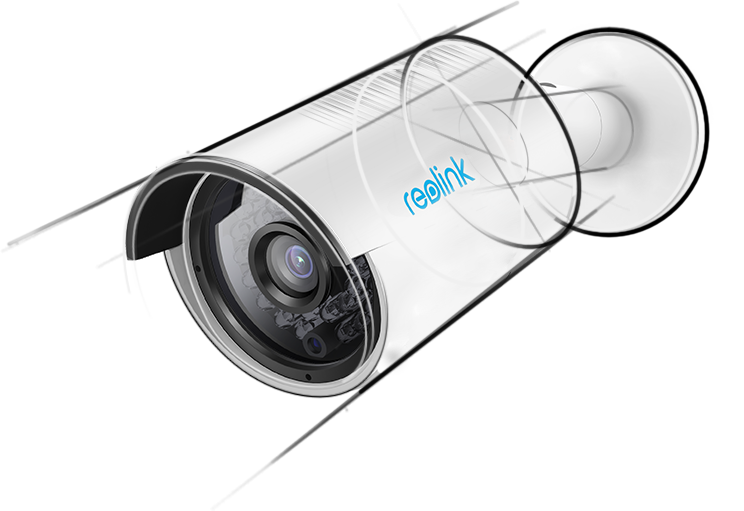 The Reolink NVR will only address Reolink cams so . . . When I replace all my cams with Reolink I'll rethink the Reolink NVR. All in all I highly recommend Reolink products ! I'm slowly replacing all of my cameras with Reolink camera's, and for good reason. They offer good quality, affordable, ONVIF compatible cameras, and they are easily accessed through APP's so even my wife can use them. I'm a do it yourself guy, don't like the pre-packaged systems with the "pay me" cloud storage. I'm replacing older 1080 drink cameras with these. 3 of the cameras are wifi and one that was so generously provided for beta by Reolink is POE, with which I use a POE adapter and power line adapter for signal. Unpacking and setting up all of the cameras were easy, and the instructions can be followed by anyone. I use my models a little more unconventionally than some, C2 in the nursery(prior to the Argus being available), 411WS on the back deck, 422W on my front Porch mounted on the wall, and 422 mounted on the front edge of my garage next to my entry keypad. Because of these placements both 422 models needed to be opened and the cameras rotated to get proper angles for maximum coverage. One slight annoyance I have is that the adjustments inside the device for changing the angle only offer 2 axis not 3. I had to remove the mount inside one of them and drill holes in the mount to get the right angle for viewing. I'm not an engineer or designer, but I would imagine these could be improved very easily. It would make the cameras suitable for more applications than just hanging down. A lot of people and businesses I know side mount dome cameras and even offering an additional mount for $5-10 would be a good deal. Aside from the inside mount, I love these cameras. I was using Security Spy on the Mac which is NVR software that can capture an unlimited number of ip camera's including these since they are ONVIF compatible. It is almost impossible to get the best quality from these cameras when using other software as the settings are just not exact for compression, transmission, etc, so I'm now just exclusively using the REOlink client. The features of the client for viewing are great, sure I could ask for a few extra things, but I don't really need them. What I do need is a much better NVR settings page in the client. It works....but gives little to no options. The only way I could guarantee I was getting round the clock recording on motion was to set every day to 24hr motion and that requires me to click on little boxes for every hour of every day of the week. Very tedious. Then the only option is "file duration", what does that even mean? Every time you see motion, it records for that many minutes. Not very intuitive. Just give us a few more options and I'd be happy. My system works great now but I have to write a script on my Mac to trash the output folders every 3 days as there are hundreds of files in each folder for each day. Regardless of these petty complaints(although the interior bracket...please fix that), I will buy more cameras to add on to the system. The video is so clear that our Local PD has asked several times for video from my 2 front cameras as my house sits at the intersection of 2 streets where icy crashes are not unusual. I would also ask that you please update or bring out a new NVR that is compatible with all your cameras. I can only use wifi as I cannot run ethernet through my house, and I'd love to buy an NVR that I can use with all my Reolink cameras, then I could uses my iMac for flex like I intended when I set it up. Also, shipping times are horrendous when ordering direct from Reolink, my cameras usually take over a month to arrive and sit in customs in LA for a few weeks on top of that. I end up ordering through amazon which is fine but they don't get the new models as quickly. Thanks for making great cameras at a fair price. Great features, compatible on my nas server. Everythings works as intended. We are so grateful for your feedback and glad to know you like the product. Please keep using and testing this product, for any more suggestion, you are welcomed to contact us, we will really appreciate it. Very impressed with this camera, clear video and construction quality is very good. I donlike that it is wireless, but wish there was an option to plug into power for the high traffic areas of my home. App is great and wasy to use. Overall i give it a 4 out of 5. Great Camera at a Great Price with a Great App to Manage it! I've had this camera for a couple of weeks now, and this camera has been amazing. This is my 5th Reolink camera and they are the greatest value on the market. This 5MP camera is quite a bit clearer than my 4MP version which was a pleasant surprise and I have had no issues with fogging as some have reported. I plugged this camera into my POE switch and by the time I opened up my Reolink app it was already online and previewing! Pros: Great Resolution and the fastest setup around, very Sturdy Aluminum Housing and Polycarbonate Dome! Cons: The only one I could find is that the base does not mount to a standard 4" round outlet box. My Sister was building a new house so we installed 4" round ceiling boxes around the perimeter of the house to put these cameras into. It would be a super easy install if it just matched up to a standard 4" ceiling box (i.e. 3.5" center mounting holes). I think this could be an easy fix for Reolink and it would make this an even greater product! The Pros outweigh the sizing issue and I will be ordering several more of the RLC-422 for the house and just make an adapter plate, to match the ceiling boxes.